Middleton Police Chief Brad Keil and Captain Noel Kakuske were recognized in front of the Middleton City Council on Tuesday night by Village of Hartland Police Chief Robert Rosch, representing the the Wisconsin Law Enforcement Accreditation Group (WILEAG), for successful completion of the law enforcement accreditation process. The Middleton Police Department accomplished and proved the required 203 standards set by the Wisconsin Law Enforcement Accreditation Group (WILEAG). The Police Department took part in a mock assessment, followed by a three-day onsite assessment to achieve their accreditation. Mr. Rosch noted that the Middleton Police Department has 22+ programs established for the community, which is the highest in any community. There are 400 police departments in the State of Wisconsin, of which only 30 have achieved accreditation. Congratulations to the Middleton Police Department on achieving this award! 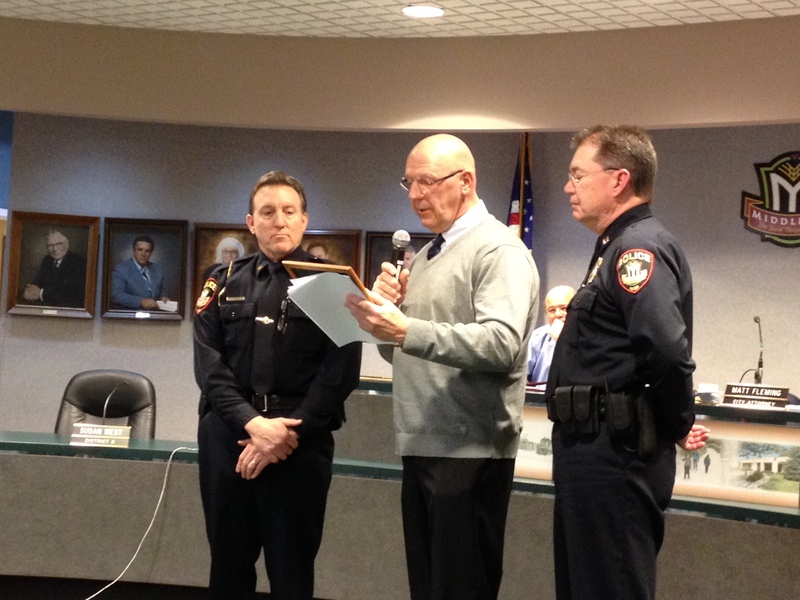 Middleton Police Chief Brad Keil and Captain Noel Kakuske were recognized in front of the Middleton City Council on Tuesday night by Village of Hartland Police Chief Robert Rosch, representing the the Wisconsin Law Enforcement Accreditation Group (WILEAG) [http://www.wileag.info/] , for successful completion of the law enforcement accreditation process.